Top-end play in the NFL, for most, takes time to develop. Sensational rookies that speed off hot out of the gates make great headlines, but the better stories can often be the ascent of the league’s underdeveloped, constantly improving young guns. Enter New Orleans Saints’ Sheldon Rankins and David Onyemata. Though relatively opposite in how they entered the NFL – one a fourth-round pick and the other a highly regarded first-rounder – Rankins’ and Onyemata’s football careers have started to run a similar course. Put simply, both Rankins and Onyemata underwhelmed in Years 1 & 2 of their respective careers, as neither of the two cracked the top-45 in overall grade in either of their first two years in the NFL (2016 and 2017). The 2018 season, however, has been a different story for the third-year interior defensive linemen. Rankins and Onyemata rank 18th and 15th, respectively, in overall grade among the 76 at the position with 300-plus defense snaps through Week 13. Most recently, Rankins and Onyemata combined for six pressures and nine defensive stops en route to 92.5 and 88.8 single-game grades in a losing effort against the Dallas Cowboys on Thursday Night Football in Week 13. The duo’s collective performance is representative of the career years both Rankins and Onyemata are having so far this season. If the season ended today, both players would have earned career-high marks nearly across the board, including overall, run-defense and pass-rush grades. After finishing his 2017 campaign with an impressive 50 total pressures, Rankins has still managed to improve significantly as a pass-rusher this season. His 11.7 pass-rush win rate and 11.0 pressure percentage both stand ahead of previous career-highs and rank 21st and 12th, respectively, among the 51 interior defensive linemen with 200-plus pass-rush snaps on the year. He also ranks tied for ninth in total pressures with 35 (23 hurries, five hits, seven sacks). 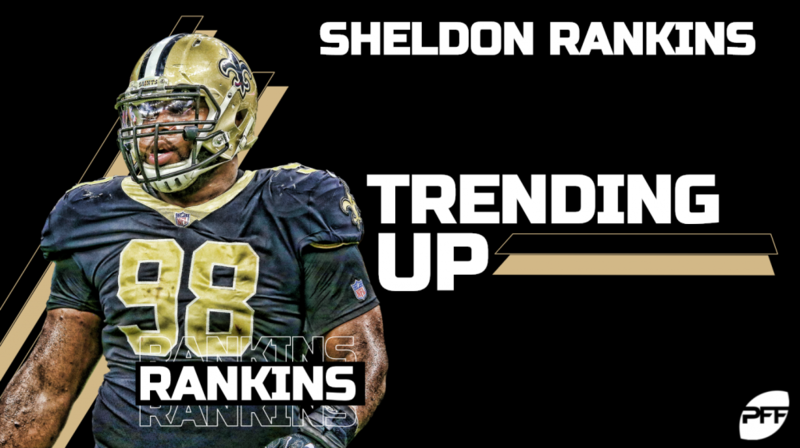 Rankins’ 72.4 run-defense grade is also much improved compared to his first two years in the NFL, and his 19.2 run-stop percentage ranks second behind just the NFL’s gold standard of run defense, Damon Harrison (19.8). In the play above, Rankins puts his elite athleticism and speed on full display, as he chases down Cowboys star running back Ezekiel Elliott down the line of scrimmage to limit the outside run to no gain. Plays like this have kept his run-stop percentage high all season long. Praise for Rankins has come easy this season, and he doesn’t even out-grade his teammate, Onyemata. The Manitoba (Canada) product ranks 10th in run-stop percentage (14.0) and 27th in pass-rush win rate (10.6) among qualifiers through 13 weeks. He’s specifically come on strong as of late, as he’s recorded 11 of his 19 total pressures in the Saints’ previous five games and ranks 18th in pass-rush win rate in Weeks 9-12. Improved play from Onyemata and Rankins has the Saints’ defense playing well above expectation, which speaks volumes to the team’s coaching staff and its ability to develop younger players along the defensive line. The arrow is pointing upward for the duo and showing no signs of turning in the opposite direction anytime soon.